I know I'm a little behind with fall decorating since most bloggers are gearing up for Christmas, but I'm behind on everything these days as you can tell by my lack of updates. Some people are very particular about not decorating for Christmas until Thanksgiving is over, but that's not the case with me. I will happily eat my turkey next to a twinkling garland any other year. The only reason I'm not dragging out the tree is that I never got to really enjoy my fall décor since I just decorated my mantel last weekend. Don't worry though, I am prepping for Christmas in a big way so I will be ready to go as soon as the pumpkin pie is finished. A new magnolia garland for the fireplace, a dried boxwood wreath for the kitchen vent hood, a huge deer statue for the entry, and other goodies are waiting for me in the hall closet. I can't wait! But, first let me show you my fall mantel! Yes, that's my new mirror! I got a great deal on it from Wayfair considering how large it is. Everything I'm buying is large these days because of the tall ceilings in the new house. It's definitely a different look from my former cottage-style home. The house is French country and as easy as it would be to decorate just in that style because of its popularity these days, I want a few transitional pieces included so it doesn't look like I went completely "French chateau." It's a beautiful look, but I would get tired of it after a while since I am fickle that way. That's what happens when you truly love so many different decorating styles. I blended my traditional horse and ornate candle snuffer with the contemporary candle holder from Target I'm using as a vase. It makes my heart sing... for a little while. I did tell you I'm fickle! Now, comes what I am so excited to show you! All of the new furniture I have ordered so far has come in. I only have a few small things to buy and then I can focus on the accessories that will really pull it all together. Will I meet my deadline to have the downstairs done by Christmas? Probably not, but it will be good enough by then. I have to apologize in advance for the terrible pictures. This house is so difficult to photograph because of the tall ceilings and large windows. I'm sure I will eventually figure it out. These shots were my third try and they are a huge improvement from the previous ones. One the first pieces of furniture I ordered for the house was this sofa. It took forever and a day because I changed the fabric to an indoor Sunbrella that looks like linen. I know it will be worth it in the end because real linen is like kryptonite if you have kids and pets. I'm still working on the lamp situation. The new standing lamp is from Pottery Barn. It has a bit of dark gold in it to complement the mirror over the fireplace. The gray shade on the silver lamp is what goes with it, but I was trying to see if the gray shade would also work on the silver lamp and forgot to switch them back. Unfortunately, that silver lamp just doesn't work here and will have to be replaced. I'm hoping it will find it's way into another room. Eventually there will be drapes above the three transoms. I'm avoiding that for a while because I know it will cost a fortune. I wasn't quite sure if I was going to place the sofa in front of the windows or put the chairs there. I've tried it both ways and they both look good, but I think it's going to stay in front of the window after living with it a few days. There's just something more comfortable about having it this way. Now, that means I get to pick a rug and coffee table based on this arrangement. It was the main reason I was holding off on both until now. If you remember, I really bought this rug for the dining room and temporarily parked it in here. The new cream chairs are from Pottery Barn, but also covered in a Sunbrella that looks like linen. I'm still a nervous wreck I'm going to spill wine or coffee on them despite their stain resistance so I usually drape a throw over them before I sit down. I think I might be worse than the kids when it comes to spilling my drinks. Now, on to the other side of the room. In my previous home I always avoided taking pictures of the TV wall because it was such an eyesore. This new media cabinet makes me love this view. I'm not a fan of the artwork and mirrors, but I needed something temporarily because the TV on that huge wall by itself looked terrible. Eventually, I will surround the TV with better artwork. At least it looks finished even if it makes me cringe a little. I'm not even going to mention the fake florals. Let's just pretend not to see those. Let your eye skim around them. I absolutely adore this media cabinet from Restoration Hardware and have eyed it for a couple of years. I never bought it because I knew there was a very good chance we would move even though I didn't want to admit we were outgrowing our house. I immediately knew this was going to be in my living room when we picked this house. The best part is that hardware! I really wanted the same hardware on my kitchen cabinets, but I couldn't find a way to make them work since the doors aren't flush with the frame. Believe me I asked the cabinet maker for these kind of cabinets, but it's not something they offered. The skeleton keys are very cool too for the doors on the ends. I have to admit I take way too much joy in opening these doors. I still have quite a few things to do for this room-coffee and end table, rug, drapes, pillows, artwork, accessories, and a chandelier. Eek! It almost seems done until I type out the list. Honestly, I'm just hoping to get the new tables, a rug and a lamp before Christmas. If that happens I will be a happy camper. Next, I will be showing you the new dining buffet and entry table. I promise I won't take a month this time! Is your fireplace electric? Everything looks lovely & cozy !!! 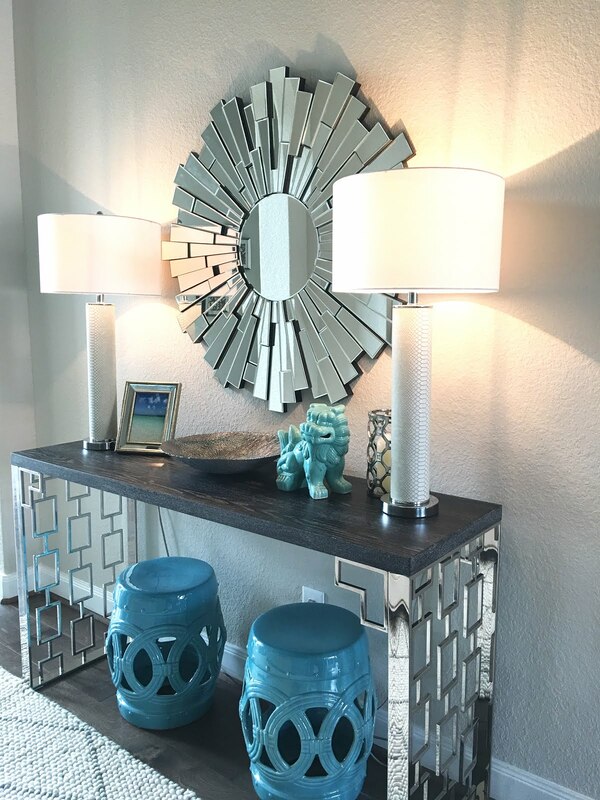 Love Wayfair too that mirror looks great ! Jennifer I finally had a chance to look back at your posts. It was so much fun seeing what you are doing in the new house. I think you are doing a FANTASTIC job. I love the new new bathroom lights, the living room sofa, the mirrors over the tv...everything! Hope you are well! I don't even know what to say other than "wow". Everything about your living room is completely amazing. I'm especially envious of your extremely shiny, fingerprint-free television - I wish I could get mine to look like that (for longer than 10 minutes).